The 2008 ACM South Pacific Programming Contest sponsored by IBM was held on Saturday 13th September at 11 sites across Australia and New Zealand. 89 teams competed for the chance to represent their country in Stockholm next year. We appreciate the sponsorship of IBM who provide T shirts and gifts to the teams, and the support of ACM who make the event possible. Congratulations to the teams and their coaches from the University of Melbourne and the University of Canterbury who will be representing the ACM South Pacific Region in Stockholm next year. It was a splendid effort and mention must also be made of the University of Tasmania. These 3 teams set themselves apart by solving 8 of the 9 problems. While the University of Melbourne has qualified for the World Finals previously (and indeed they won it in 1992 - no pressure on this year's team!!!! ), this will be the first time that Canterbury has represented the Region. We have increased the number of sites in the Region, going from 9 to 11 and the Sydney site was filled to overflowing. We were the first Region to use the new registration system and we identified a few small issues so I thank you all for your patience. Only when you are the first users of a system do you REALLY, REALLY appreciate good programming and great testing. * 61 teams solving at least 3 problems. This is just a fantastic result and one that we have been trying to achieve for some time. Thanks to the Judging team for their efforts. Special mention must be made of IBM. They have been very generous in their support of us. It makes our job so much easier knowing that the cost of the prizes and refreshments have been covered. Thanks also to all the volunteers at each of the sites - the site co-ordinators, the technicians, the admin staff, the coaches who acted as judges on the day and all the other volunteers whose contribution allowed our teams to have this opportunity. In New Zealand, we ran a parallel contest for 4 high school teams and this pilot proved that we have some younger students who are very capable already and who can only get better. While they had 3 specially designed problems to solve, they also had the ACM set and managed to solved some of these as well. Finally, thanks to all the teams and their coaches. With the high performance levels it is obvious that there is some great coaching going on. Thankyou all for providing such a competitive contest. See our results page for the top 10. 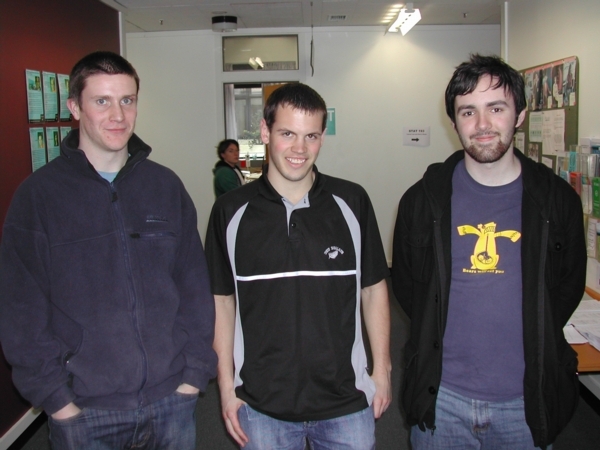 Congratulations to Alex Mackay, Lachlan Horne and William Jarman from team char*groupName (University of Adelaide) for winning the Adelaide site with 6 problems in 794 minutes. Second was Dao Xiang, Hongbo Liu and Shouhen Shi from Lucky Team (University of Adelaide) with 5 problems in 811 minutes; third was Matthew Le Krupa, Julian Kula and Bradley Wesson from team Flinders 2 (Flinders University) with 5 problems in 1073 minutes and fourth was Adam Gatt, Francis Georg and Slava Shekh from team UniSA Sr (University of South Australia) with 3 questions in 176 minutes. The Adelaide site had 12 teams competing, 3 from Flinders University, 2 from University of South Australia and 7 from University of Adelaide. We had a strong showing from all year levels, including multiple teams of 1st/2nd years and every team got at least one question, which was fantastic. Thanks to all of the people who helped out on the day. Thanks to Paul Calder (Flinders University), Stewert Von Itzstein (University of South Australia), Patrick Coleman (University of Adelaide) for helping with the judging, and to Joseph Kuehn for his assistance with training and everything else. Particular thanks to our site director, Yuval Yarom, for ensuring things ran smoothly on the day. Teams from University of Waikato, University of Auckland and AUT University were competing for site honours and to be New Zealand's representative in Stockholm. Glen Archbold from IBM started proceedings in the morning, and the reigning South Pacific Champions, Brie (previously known as Thursday) from U Auckland told us of their experiences in Banff. We started on time, and several teams solved one or two problems in the first half hour. The staff were kept busy supplying balloons (well, rectangular pieces of coloured paper on sticks!) during the afternoon. Our leading teams kept a careful eye on the scoreboard to see how the other New Zealand teams were faring, particularly the two teams from Christchurch who were clearly not keen to let U Auckland represent their country in the finals yet again. Congratulations to Brie who are again the Auckland Site Champions - but they will not be representing New Zealand this time! As an experiment, we had 3 secondary school teams competing against each other. The aim is to give them a taste of the contest so that they will spread the word when they go to university and become eligible to compete properly. Two teams from Lynfield College, and one from Hamilton Boys High School competed, with the Hamilton team winning by solving the three special high school problems, plus 2 of the main problems. Thanks to Art Brown and Aaron Cheesman our AUT technical staff, to Gordon Grimsey, Jacqui Whalley (AUT), Raewyn Boersen (Regional Contest Director) and Margot Phillipps (Lynfield College) who helped on the contest floor, and to Michael Dinneen (U Auckland), Bill Rogers and Perry Lorier (U Waikato) our site judges. We had 13 teams in Brisbane this year with one team from University of Queensland, one team from Griffith University and eleven teams from QUT. Judging on the day were Colin Fidge and Malcolm Corney. Neil Muspratt provided help on the technical side and there were no technical issues on the day. We had operational help from Diane Corney, Helen Groom, Sui Guan Teo, Sriram Raghavan and Eric Tang. Thanks to all for your efforts. We started on time at midday and were kept very busy as the submissions for the first two problems poured in with the first submission on Problem A at the four minute mark. The Brisbane site was won by The A*-Team (Tim Chappell, Jack Chen and Ashley Donaldson) from QUT with six correct submissions. After rejudging, second place went to University of Queensland's team UQ::TripleLinkedList with five correct. Another QUT team - Code, Compile, Conquer - rounded out the top three, also with five correct. All teams on site solved at least one problem. Thanks to the sponsors, the organizers and the head judge for an interesting problem set. The Canberra site ran smoothly this year. Team 'Atra' with David, Jack and Ian, did very well getting 5 of the 9 problems out. Our first year team, team 'red', also performed well with 4 problems out. Congratulations to Teams 'Cantercoders' and 'JET" for a truly outstanding performance that placed them in the top 5 places. The Christchurch site started on time, and both the teams were consistently among the highest scoring teams during the competition. We also organized a practice session on Thursday that was found to be extremely useful for both students and site administrators. Many thanks to Joffre Horlor for providing technical support throughout the practice session and the main contest. both of whom had competed in their home countries. The school team did well, getting four out in the end -- two of 'theirs' and two 'real' ones. I have passed their address on to Margot in case she wants to contact them. Thanks to IBM for sponsoring us, the teams liked the t-shirts and pens (I still have enough to hand write about 47 novels the size of 'War and Peace', but I am sure that I will find worthy recipients). Thanks to the ACM team for providing me with a fantastic example of how not to design a Web interface for my User Interfaces course, to Phil and Raewyn for administering the contest and to Hossan for providing an interesting and challenging set of questions. Pity about the problems on the day, but I know the stresses of the job, so will only offer my sympathy, I know how easy it is for everything to go pear-shaped. Locally thanks to Nick Meek for keeping PC^2 running smoothly (although by his own admission that is less arduous than it used to be) and to Tracey Cuthbertson for working her magic on the student's accounts to prevent them from doing naughty things. Tony Gray (Technical Director), Robyn Gibson (Judge), Matthew Armsby (Technician), Andrew Spilling (Technician) and Julia Mollison (Travel and Food Organiser). The Melbourne site had 7 teams this year, all from the University of Melbourne. Thanks to our volunteer judge Iain McCoy for helping out on the day. The competition ran smoothly, with no technical problems. All the teams performed well and had lots of fun. Congratulations to Victor Lei, Christopher Chen and Angus McInnes (melb-team4, later renamed 'Hi Pat') who topped the Melbourne site with seven correct solutions (perhaps 8, depending on the outcome of re-judging the troublesome question C) - a remarkable effort! Thanks to the organizers for a fun competition and especially to Hossam the chief judge. For the fifth year running, The University of Western Australia hosted the Perth site of the South Pacific Programming Contest. Eleven teams braved the early morning cold to take part in the 5-hour international programming competition that pitted the abilities of the best programmers from across the Australia/New Zealand region against each other. Starting at a blistering pace (one team producing their first submission after just 7 minutes), the competition was intense for the full five hours as the teams worked their way through what was generally agreed to be a well balanced problem set. There was a constant stream of submissions (82 in total at an success rate of 55%), ensuring the judges were kept busy for the entire event. Indeed, by the end, contestants and staff alike were thoroughly drained and exhausted. Congratulations go to the winners Peter Alexander, Dean Scarff, and Evgeni Sergeev from team "Twisted Deque" for taking out the Perth competition, besting strong competition from the 10 other teams. Peter, Dean, and Evgeni had a blistering start, submitting their seventh correct problem within three hours, catapulting them at the time to leaders within the regional competition. Unfortunately they were unable to complete either of the remaining two problems, but still finished within the top five in the region, the fifth time in a row a team from the West has finished within the top five in the region. Team "James Hales' Incredible Taskforce" managed to complete six questions in the alloted time, placing them second in the local competition, with team "Mark 1" rounding out the top three with five correct questions. Four teams completed four questions correctly, two teams completed three questions, with the remaining two teams each completing two questions. All-in-all, an impressive effort that saw all Perth-based teams get onto the scoreboard. Special mention must go to the James Hales' team - a team comprised mostly of first-year students. Hopefully the experience they obtained will put them in good stead for subsequent competitions. Problems A and B proved to the be most popular for the Perth-based teams, with all teams successfully completing these two problems. Problems C, D, and E proved to be the next most popular problems, with a good proportion of teams completing these problems. At the other end of the spectrum, no Perth team successfully completed problem H, although a number of teams attempted it, and no team made a submission for question G at all. All-in-all, the event ran exceedingly smoothly, with all teams seemingly enjoying the experience. This is in no small part thanks to the excellent volunteers who helped organise and the run the competition. Thanks are due to: Ashley Chew (technician), Chris McDonald, Nicola Ritter, and Tim French (judges), Paula Langley, Marilyn Monaghan, and Nicola Hallsworth (administrative assistance), and Vanessa Wee, Pheobe Downes, and Joe Sandon (logistical support). Special thanks must also be given to IBM and the ACM for their sponsorship and to the tireless work of the competition organisers for preparing the competition. The Sydney Site had a huge growth in numbers this year, with 21 teams on the day (a little over what we had expected, and over our limit). We were pleased to have a strong contingent of 5 teams from Macquarie this year, as well as 11 from UNSW, 5 from Sydney. Every team solved at least two problems. Three teams solved 3 problems, 9 solved four, 4 solved 5 and the winners solved 6. Congratulations to Sam McNally, Adrian Ratter, Yanjin Zhu, Aleks Ignjatovic, team "SOS" from UNSW as top team for the Sydney region, with 6 problems solved in 701 minutes. Second was "void" from UNSW with 5 problems in 354 minutes and third was "Return of the First Years" from Sydney with 5 problems in 514 minutes. Top first year team, was "First years" from Sydney and top second year team was"Aadvark" from Sydney and the top Macquarie team was MQTeam02-08 with 4 problems out. Things ran smoothly, thanks to all the people who involved in the set up and on the day. Particular thanks to our Site Technical Director, Greg Ryan, who transformed the teaching labs and supported practices and on the day. Thanks to Bob Kummerfeld who helped with everything. Wellington had only two local teams participate in the contest. Both of the teams did well, solving 5 and 6 problems out of 9. Everyone has enjoyed the problems and would love to participate again if they are eligible next year. The prizes from IBM were plenty and everyone walked away with lots of goodies. The practice session proved invaluable and meant that the main contest proceeded without a single hitch. .